An array of classical musicians from the Boston area will be offering a free concert to benefit Syrian humanitarian work on November 12th at 8pm at the United Parish Church Brookline, 210 Harvard Street. “A Song for Syria” will bring together six well-known ensembles under the same roof to raise awareness and provide funding for the many people affected by the crisis in that part of the Mideast. Collaborating musicians will include members of local ensembles Blue Heron, Boston Camerata, the Consort of Hope, the DooZhen Arabic Choir, the Lorelei Ensemble, and the United Parish Choir. The music will range over the centuries, from the Middle Ages to the Middle East. The sponsoring organizations are Camerata Mediterranea, which organized a similar successful event in 2015, and the United Parish Church in Brookline. Seating will be unreserved, first come / first served, and donations will be requested. “A Song for Syria” is part of a weekend of performances on behalf of civilians in Syria, also including “Boston Songs for Syria” on Sunday November 13th at 3pm in Old South Church with music by Ilene Stahl and Klezperanto, and the Layaali Arabic Music Ensemble raising funds for the Syrian American Medical Society. Blue Heron, directed by Scott Metcalfe, has been acclaimed by the Boston Globe as “one of the Boston music community’s indispensables” and hailed by Alex Ross in the New Yorker for the “expressive intensity” of their interpretations. The ensemble presents a concert series in Cambridge, has appeared across the country, and has released six CDs, with a seventh due out next year. Its latest undertaking is a longterm project to perform the complete works of Johannes Ockeghem, entitled Ockeghem@600. Currently celebrating its 62nd anniversary, the Boston Camerata ranks among the world’s oldest and most eminent early-music ensembles. Founded in 1954, Camerata has been under the direction of French-born singer and scholar Anne Azéma since 2008. Camerata’s repertoires span centuries, with focus on the European Middle Ages, the intersection of Eastern and Western musical cultures, and the music of the New World. Many of Anne Azéma’s recent productions involve theater, movement, and storytelling. Camerata travel extensively; international tours during 2016 have brought the company to Brazil, France, and Germany. Camerata’s numerous distinctions include important foundation grants, critics’ awards, and the Grand Prix du Disque. The Consort for Hope (Liza Malamut, coordinator) is a specially constituted association of virtuoso wind players, each one a renowned specialist on an early-brass instrument (cornet and sackbut) from the Renaissance. They will be performing works on their own and in association with singers of the Camerata. DooZhen Arabic Choir (Nizar Fares, director) is an ensemble of singers from the Lawrence-Lowell area performing primarily in the Arabic language, presenting repertoire from the sacred and secular traditions of the Near East. Fares is well-known for his area performances as a singer before church congregations of many denominations, and is also a regular visitor to Lebanon and Syria, where he regularly performs relief work. He is currently preparing a book on vocal orientation in the musics of Egypt, Syria, Lebanon, and Iraq. Lorelei Ensemble (Beth Willer, artistic director) is a vocal ensemble comprising nine women whose expertise ranges from early to contemporary repertoire and whose rich and diverse vocal palette defines the ensemble’s consistent delivery of “exact, smooth, and stylish” programming. Committed to the expansion of repertoire for women’s voices, Lorelei has commissioned and premiered over 50 works while exposing and reinventing early works of the Medieval, Renaissance, and Baroque. Driven by their mission to advance and enrich women’s vocal repertoire through collaboration, Lorelei works with composers to create new works that reveal the extraordinary flexibility and strength of the human voice. Camerata Mediterranea, (Joel Cohen, director; Yasmina Kamal, project coordinator) is a nonprofit intercultural institute of musical exchanges. 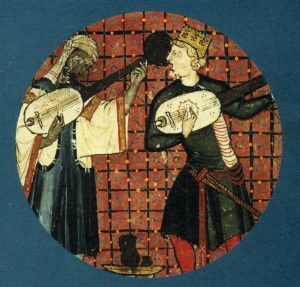 With homes in both France and the United States, Camerata Mediterranea devotes itself to research, dialogue, and pedagogy involving the musical civilizations of the Mediterranean basin, Christian, Jewish, and Muslim. It aims to revive the value of forgotten interactions. It intends to reestablish a dialogue, at once artistic, intellectual and human, among civilizations. Recent American activities include lecture-seminars and performances at Boston and Wellesley Colleges and a 2015 benefit concert for Syrian refugees at Harvard University’s Memorial Church. Camerata Mediterranea seeks active volunteer participants and donors for future projects in the New England area. The United Parish in Brookline is the 1970 merger of three Brookline Protestant churches, the Harvard Church (United Church of Christ, UCC), St Mark’s Methodist Church, and the American Baptist Church, in a bold and joyful experiment in ecumenical unity to honor God and those in need. Today the United Parish continues to be a vibrant, welcoming, diverse community from a variety of traditions seeking to grow spiritually and to serve the world. In 2008, UPB began conversations with Syrian-American composer Kareem Roustom to commission a new work for the church, and three years later the UP adult choir joined forces with Coro Allegro to perform the critically acclaimed premiere of Roustom’s The Son of Man, based on Khalil Gibran’s Jesus, the Son of Man. United Parish Brookline is honored to support this concert to offer comfort to the Syrian community in Boston. Great! Hope its a success! Carry on! Many, many thanks to the people who filled the church for this concert, and for the wonderful ensembles — Blue Heron, Boston Camerata, the newly-formed Consort for Hope, DooZhen, and Lorelei, for their superb music making. Thanks as well to United Parish in Brookline for their choir participation, and their co-sponsorship. The event surpassed our expectations, raising somewhere north of $12,000 for Doctors without Borders and their work in Syria. On behalf of Camerata Mediterranea, herewith are “bravi” and hugs all around!